Arm Wrestling can be traced all the way back to acient Egypt where a painting depicting a type of arm wrestling was found in an Egyptian tomb dating to about 2,000 B.C. The modern sport is based on a Native American game. In fact, it was usually called "Indian wrestling" when practiced by frontiersman during the 19th century and by children in the 20th century. 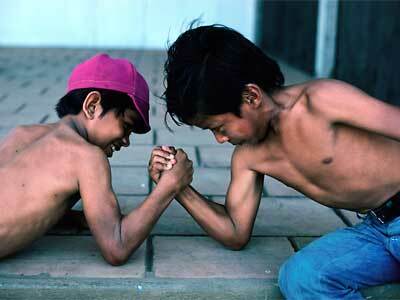 In addition to what has become known as arm wrestling, there are several other forms of "Indian wrestling." In one, the opponents stand facing one another, with the outer sides of their right feet set together and their right hands interlocked. The object is to throw the opponent off balance. In another, the opponents lie down with their near arms and near legs locked and each tries to force the other's leg down. In arm wrestling, which has now become a genuinely international sport, the opponents are seated at a table, facing one another. They lock their hands (usually the right hands, but there is now also left-handed competition), with their elbows firmly planted on the flat surface, and each attempts to force the others arm down to the table. In addition to being a semi-popular sport among high school and college students, arm wrestling was a tavern sport and the first organized competition was staged by a journalist, Bill Soberanes, in 1952 at Gilardi's Saloon in Petaluma, California. Over the next ten years, it became bigger and bigger. In 1962, the tournament moved to a large auditorium in Petaluma and renamed it the World Wristwrestling Championship. The sport got a major boost from "Peanuts" cartoonist Charles Schulz in 1968. Schulz did a series of comic strips in which Snoopy was headed to Petaluma to try to win the championship. However, in the last strip, he was barred from competition because the rules require that you lock thumbs with your opponent and Snoopy had no thumb. Largely because of that publicity, the championship was televised on ABC's Wide World of Sports in 1969 and became an annual event on the program for 16 years. The World Armsport Federation (WAF), was founded with the United States, Canada, Brazil, and India as the first members. In 1992, the World Armsport Federation (WAF), held its first world championships in Switzerland. Incidentally, although arm wrestling and wrist wrestling are generally considered the same sport, there's one slight technical difference between them. In arm wrestling, opponents grip a peg with the free hand. In wrist wrestling, they grip their free hands across the table. In 2010 Robert Drenk in conjunction with Bill Collins formed the Ultimate Armwrestling League with the Vision of bringing Armwrestling to the Masses, getting the public excited and involved in this sport again is in the makings... Armwrestling is Back!